The state seeks to guarantee the authenticity and quality of the Yucatecan product…..
MERIDA — After having the designation of origin, the Yucatán habanero pepper will enter the accreditation process along with 12 other Mexican products, with the aim of guaranteeing its authenticity of the region and preventing its name from being used in other parts of the country or the world. The Secretary General of the Confederation of National Chambers of Commerce, Services and Tourism (Concanaco Servytur), José Manuel López Campos, explained that the accreditation process of the 12 Mexican products will be through the Mexican Accreditation Entity (EMA), which will visit the state in November to meet with businessmen and authorities related to the issue, according to a statement. 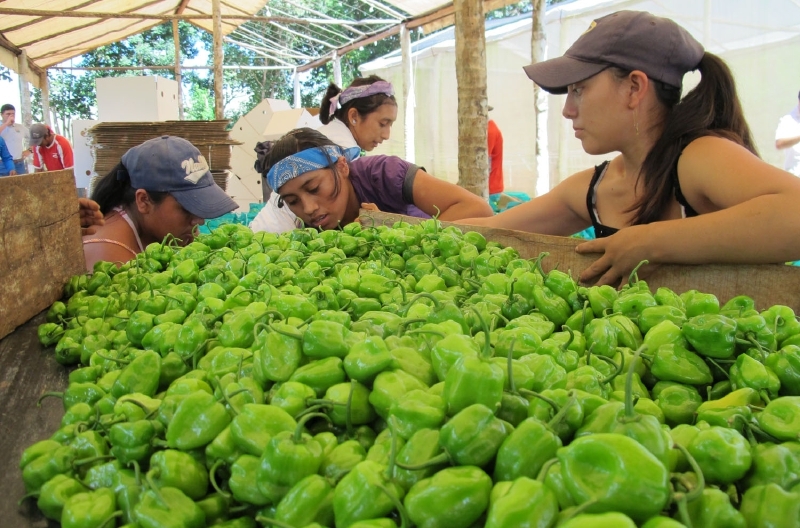 This accreditation, said the leader, will allow limited competition, because it will only be possible to have the name of habanero pepper the one that is grown in the region, and everything that is elaborated from the spicy raw material will have to be processed in the entity. This initiative aims to increase the attraction of investment in the peninsula in this area and strengthen the brand of the habanero pepper in the world market, a situation that will benefit the producers and entrepreneurs of that sector, while delimiting the competition, he said. López Campos detailed that there are currently 15 products with the Denomination of Origin, of which only the following three have the Certification of the Mexican Accreditation Entity: Tequila, La Talavera (Puebla traditional pottery) and Mezcal. With the certification process, he said, it is sought that products such as the habanero chile, with a long tradition in Yucatan and the Peninsula, have the authenticity of the product of the region, to protect its origin, but above all other entities or countries can market it with that name. To this aim, the Mexican Accreditation Entity (EMA), in coordination with the Ministry of Tourism and Concanaco, will hold a series of meetings in the states where there are products with a designation of origin, in order to endorse this compliance with the Official Mexican Standard (NOM), at the same time that they can verify that their product meets the requirements to obtain the certification issued by the EMA. The business leader said that to address this issue, a meeting is scheduled in this city next November 10, which will include staff from the Mexican Accreditation Entity, CONCANACO, federal and state agencies, as well as producers of habanero pepper. This initiative, he said, was taken on the issue that other nations, such as China, have begun to copy or harvest traditional Mexican products, which offer in the world market at lower prices, but do not have the quality offered by the producers. The secretary general of Concanaco said that among the products that are intended to certify is Morelos rice; amber of Chiapas; coffee of Veracruz; handicrafts of Olinalá, Guerrero; the vanilla of Papantla, Veracruz; the cocoa Grijalva of Tabasco, the sotol, the bacanora and the charanda, besides the guitars of bumper. In the case of Yucatan, habanero chile has the denomination of Peninsular origin, hence certification will be sought, and for which it will have to hold working meetings with authorities and producers of Campeche, Quintana Roo and Yucatan, to define whether it will be habanero pepper from Yucatan or peninsular habanero pepper, stressed José Manuel López Campos.